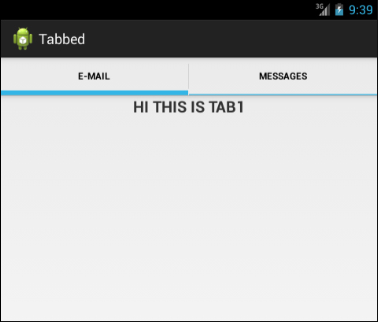 In this article we will see the process to create tabs in an Android Application. This is the easier way to navigate through the different parts of an app quickly. Implementing tabs enhances an app’s UI and provides an easy way to navigate through the different parts of an app quickly. Consider a scenario where you want to develop a contacts manager app, which consists of four activities: adding a contact, deleting a contact, searching a contact, and speed dial. Such an app can be easily developed by using tabs. Tabs will help you to navigate easily to the different parts of an app. The following figure depicts a tabbed app. Tab host: It is the main container for tab buttons and tab content. Tab widget: It consists of the row of buttons, which may contain icons and/or text labels. 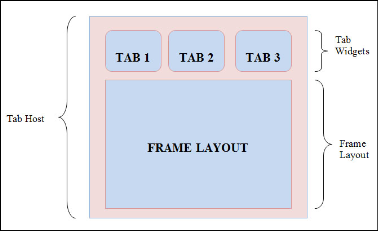 Frame layout: It is the container for the tab content. The following figure displays the preceding components. By navigating through multiple views within one activity. After creating the layout for tabs, you will need to provide the functionality for the tab buttons. 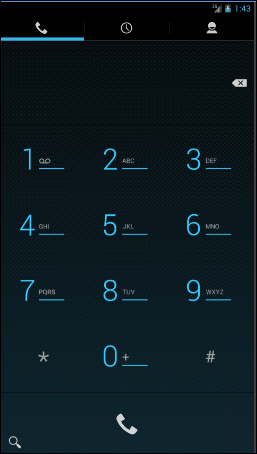 To implement tabs, you will need to use the TabHost class available in the android.widget package. It holds a set of tab labels to select a specific tab and a FrameLayout object that displays the content of the tab. The TabHost class is used to control the individual tab elements. The following table displays some methods defined in the TabHostclass. tabSpec: Specifies the way to create the tab indicator and content. Adds a tab with the specific tab specification. Removes all tabs from the tab widget that is associate with the tab host. Retrieves FrameLayout that holds the tab content. tag: Refers to the tag text of the tab. Retrieves a new tab specification associated with the tab host. Is called before adding tabs after the tab host been loaded by using the findViewById() method. Tab indicator: A label or a label with an icon. The TabHost.TabSpec class is used to set the tab indicator. The TabHost.TabSpec class also provides the TabSpec.setIndicator() method that allows you to set the title for the tab. Tab content: The content to be displayed for the tab. You can specify the content for each tab by using the TabSpec.setContent() method. // Declaring TabHost and TabSpec objects . // Initializing the Tab host. // Using the tab1.xml file for tab1 content . // Setting a label and an icon for tab1. // Calling ActivityOne through intent . // Using the tab2.xml file for tab2 content. // Setting a label and an icon for tab2. // Calling ActivityTwo through intent. // Adding tab1 and tab2 to the TabHost. The following figure displays the output of the preceding code. A style is a collection of attributes used to specify the look and format for a view or a window. We can customize the various properties of an app by using styles, such as height, padding, font color, font size, and background color. Styles on the Android apps are similar to the cascading style sheets in Web pages, allowing us to separate the design from the content. A theme is a style applied to an entire app or activity. When a style is applied as a theme, every view in the activity or app will implement each style property that it supports. For example, you can apply the font style as a theme for an activity, and then all text views inside that activity will display text in that font style. <resources>: Declares the root node in the XML file. <style>: Declares a style. It must implement the name attribute that uniquely identifies each style. <item>: Declares a property of the style. It must implement the name attribute that declares the style property and its corresponding value. In the preceding markup, the parent attribute declared within the element is optional. It is used to specify the resource ID of another style from which this style should inherit some properties. Though, you can later override the inherited style properties. In addition, at the time of compilation, every element within the <resources> element will get converted into an instance of the app resource and can be referenced later in either the XML file or the manifest file. The preceding markup inherits from both, the Mystyle styleand the Mystyle.Blue style. You can set the style for an individual element. You can apply the style as a theme to the entire activity or app. The following figure displays the output of the preceding markup. Figure 4: Setting a Style for the Text View. If you want a theme applied to the entire app, you need to add the android:theme attribute to the tag instead. Note: All view objects don’t accept all style attributes, and therefore, you need to refer to the specific view class for supported style properties. If you apply a style to a view that doesn’t support all properties defined in the style, it will apply only those properties that are supported by the view. Some style properties are not supported by view elements. These properties are only applied as themes for the entire window. These attributes usually begin with the word, window, such as windowNoTitle and windowBackground. // TODO Auto-generated constructor stub . widthMeasureSpec: It refers to the horizontal space requirements as imposed by the parent. onKeyDown: Invoked when any device key is pressed. It includes the device’s keypad, camera buttons, dialing pad, back buttons, and hang-up buttons. onKeyUp: Invoked when the user releases a pressed key. onTrackballEvent: Invoked when the trackball of the device is used. onTouchEvent: Invoked when the user does a tap or a click on the touch screen of the device. This is all for today’s article, I hope you're enjoying my tutorials in the MrBool website, please give your feedback below leaving a comment to my article.